There is hope for our marriages and children. 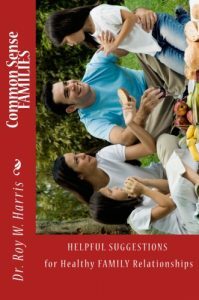 This book offers ways to Strengthen Marriages, Build up Children, and Create an Environment in which parents and children can build lifelong enduring relationships. Common Sense FAMILIES tackles several important areas which impact families: Husband & wife RELATIONSHIPS, BASIC NEEDS of men and women, TRAINING CHILDREN, Child DISCIPLINE, Understanding and dealing with TEENAGERS, How to MAKE CHANGES in your home, Parenting GROWN CHILDREN, Understanding and Building BLENDED FAMILIES, and much more. Whether a TUNE UP for you own family or a TOOL encouraging others, you’ll find this book a great resource.